Before configuring your account, the contact center's management team must define a standard configuration for each type of agent that works in the contact center. The contact center administrator can then use those standard configuration values to guide the use of the My Profile page in Agent ConsoleVirtual Contact Center's browser-based graphical user interface (GUI) used by Agents to manage customer interactions. to configure a given agent's account. My Profile: Presents information on agent name, display name, tenant name, tenant label, and product version and revision. Personal: Lets you view or edit email address and phone number, and make verification calls to the specified number. You can save email addresses with up to 254 characters. Personalization: Allows you to personalize your Agent Console with notification sound alerts, and specify the date format, default signature, default email signature, and more. Assigned Queues: Specifies inbound and outbound phone, chat, email, and voicemail queues to which the agent is assigned. Direct Agent AccessIn an IVR script, direct agent access permits a caller to reach an agent directly rather than through skills-based routing logic. : If enabled, the agent can be reached directly via Direct Access Number. Agent Voicemail: If enabled, the agent is able to receive voicemail via email. The voicemail is left by the customers who try to reach the agent directly. Default CLId: Displays the default caller ID for the agent's outbound calls. Revision: Displays the Virtual Contact CenterA contact center that enables agents to be located in different geographical locations yet managed as if they were located in the same physical location. revision number. Prompt Timeout: Indicates the duration of an interaction offered to the agent before it goes back to the queue. Language: Indicates the language of the Agent Console application. Direct Access Number: Presents the extension number that can be used to reach the agent directly. Agents can communicate this number with their customers. Primary Language: Indicates the primary language of the agent. Agents are assigned with a primary language and one or more languages of fluency used during multilingual customer chats. See Handling Multilingual Chats for more details. Cluster id: The cluster ID is used for system diagnostics. Provide this number to your support technician for system troubleshooting. Version Package: Displays the Virtual Contact Center version number. Dial Plan: Represents the system dial plan such as International Numbering Plan (ITU-T E.164). Dial plans take numbers dialed by users or originated from other Virtual Contact Center components and apply editing rules to yield a valid number. Secondary Language: Indicates the secondary language of the agent used during multilingual customer chats. It is a language of fluency picked by the agent and in addition to the agent's primary language. See Handle Multilingual Chats for more details. Display Name: If enabled, agents can enter a customized display name to present themselves. Having a display name helps agents save time and effort to introduce themselves to customers every time they start a new chat. The agent's display name also appears on the Control Panel, Profile page, chat window, and CRM case created after a chat session. The display name can be modified by both the Virtual Contact Center administrator in the Configuration Manager, or if enabled, by the agents in Agent Console. The changes immediately appear in both applications. Current Country: Select a country from the list, if enabled by the administrator. Workplace Phone: Designated number to process interactions in Agent Console. It can be the agent's desk phone, cell phone, or any other phone. Workplace SIP URI: Specifies the SIP Phone URI of a VOIP phone. The SIP URI resembles an e-mail address and is written in the following format: SIP URI = sip:[email protected]:Port where x is the username and y is the host (domain or IP). Make Verification Call: Places a test call to the specified phone number for verification. On answering the verification call, you can set up a voicemail greeting. Date Format: Offers a choice of date formats to apply on all email notifications sent to and from the tenant. Default Signature: Choose the default email signature used when sending email messages from the agent's account. When the agent uses the CRM case management page to send an email, the default signature appears as one of the choices in the Signature list. Default From: Choose the default From address used when sending email messages from this account. When the agent uses the Local CRM to send emails to customers, the default address is automatically populated or appears as one of the choices in the From list. Interaction Sound: Provides a choice of alert sounds to notify a new interaction. Select an interaction sound from the list and click Play to hear the notification sound. Chat Message Sound: Provides a choice of alert sounds to notify a new chat interaction. Select an interaction sound from the list and click Play to hear the notification sound. Show chat message browser notification: If enabled, the agent receives a browser notification on an incoming chat from customer. Reset preferences to default: Use the reset button to restore preferences to system default. This option resets your visible columns, tabs, sounds, date format, notifications, and cases. It also clears favorite settings and Recents, and causes page to reload. See the list of the preferences that is saved on server. Email Signature: Type the email signature for this account. When the agent uses the CRM case management page to send an email, the agent can choose to insert this Signature in the message. Old Password, New Password, Retype Password: By default, the current password is listed for all three fields. If an agent wishes to change the password, they should enter the old password and new password, and confirm the new password. External Setup If Agent Console has been configured to interoperate with a third-party CRM, you must enter the login credentials the agent uses to access the third-party CRM in External Username and External Password. Assigned Queues The agent's queue memberships (inbound, outbound, chat, email, and voicemail) are displayed in Assigned Queues by default. 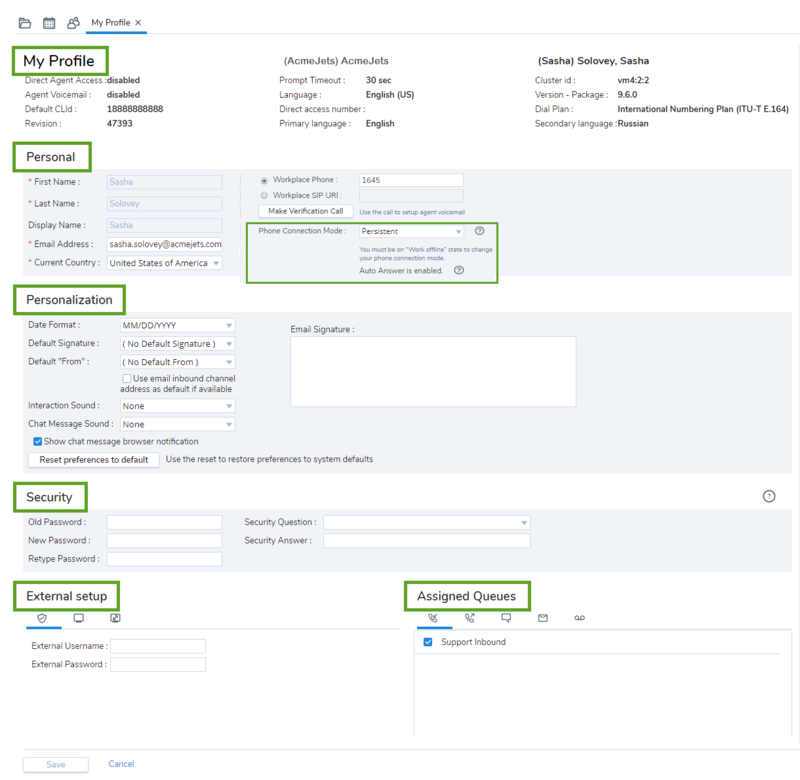 If the Virtual Contact Center administrator enables Allow agent to change Enable/Disable settings in Assigned Queues for an agent in Configuration Manager, the agent can use Assigned Queues to disable a queue's ability to offer interactions.